The pen may be mightier than the sword, but what about the stylus? The more typing and swiping we do, the more indispensable a digital stylus becomes. So which is mightier? With a Unitrex TouchPen, you don't have to choose between a touchscreen stylus and a conventional pen. You get both in one slick package. The creator, Les Wagenheim, developed the multitasking TouchPen for his wife, who had trouble using touchscreen devices with long fingernails. One end functions as a touchpad stylus with conductive properties so you can type, swipe and scroll with precision… and without smudging your smartphone or tablet screen with fingerprints. When you want to use a regular pen, simply remove the pen cover (6-inch JAZZ model) or twist the barrel (4-inch PALM version) to reveal a pen point. Texting, typing, swiping and scrolling have become part of our everyday routines, but that doesn't mean we're ready to give up pen and paper. 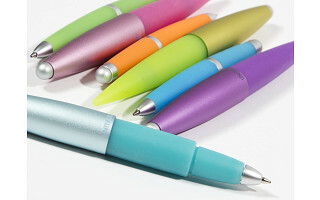 With an ergonomic TouchPen, you can jump from paperwork to pixels without missing a Tweet. Hi Daily Grommet, I'm Les and I'm here to talk to you about touchscreen pens. I'm happy to answer any questions, thanks! I have a galaxy, can I use any one of these. Love this idea!! Can this ship to Canada? I have a techy niece who would love this. @KATHIE TURNBULL Sure Kathie, we do it all the time. Do you celebrate Easter there? Are the pens refillable? If so, is it a commonly found refill? @ Judy Absolutely, the factory is the premier maker of writing instruments in the world. @Les Wagenheim Thanks for getting back to me! I love new tech! I love people that come up with answers to make it better and easier! I am going to use the ink pen part on my new Whitelines notebook to draw and write notes, then use the other end to get the info on to the phone. Thank you so much! @ Robin Boyter You sound artistic, must be left handed like me! I know you say it will work on all devices but does that include the NOOK HD? Does it work with Wacom Tablets by any chance? @Les Wagenheim So you mean I could edit photos and draw in photoshop with a Wacom Tablet using this pen? Does it include pressure sensitivity? What is the difference between the Jazz and Palm that causes the price differential? @ Marianne Good question, the Jazz has an anodized aluminum cover. Also, the amount of material (silicon rubber) is greater. The mold is also a bit complicated due to the shape and a bit larger as well. What type of point is on the pen-fine,medium, or whatever? Are they refillable? I assume they are ballponts. @Nancy Garneau Yes Nancy, they are refillable, standard Parker style for the Jazz and Cross for the others. Med point blue ink, smooth as silk...You won't be able to keep your hands off it. When you take the cap off, can you put the cap on the other end of the pen and will it stay put? This is important to me. If it doesn't attach firmly I will lose the cap within the first week of use. Also, do you have any return policy? @ S. Gilbertson Ahah, we thought of that because you and I think the same way. The cap on the Jazz fits on the opposite side when using the stylus. And we do accept returns if you are not satisfied. I am sure it will become one of your most favorite possessions. Since the Palm pen does not have a cap on the ink end, does it twist to close? @English Atkins Yep, twist to extend and again to retract. Nice and compact to fit in the smallest places. Does it ever skip..Is it constant in it's performance? @ marlene Hi Marlene, we guarantee it. Smooth as silk. The refills are of the finest quality, I promise! @ Shelly Sloan Yeah Shelly, some of us are still hard at work. Gave up tennis and all those good times. Now set, game, match with every order of TouchPens. Can the ink cartridge be replaced when it runs out of ink? If so, where is it available.? @ Barb If you can find an Office Max, Office Depot, or any stationery supply store, you can get a replacement refill. Parker style for the Jazz and Cross for the others. But they last a long long time. I bought several TouchPens because I love the colors and styles. I keep one handy everywhere I use my devices. After getting used to the comfort of the pen and the convenience of the stylus, I never go anywhere without my TouchPens. Does it ever come with black ink? Good question. It appears that it comes with blue ink, although if refills are readily available at any office supply store, it's likely you can refill with black ink too. I'm checking with Les to be certain. Stay tuned. @Sally Dominguez St John Hi Sally, we debated about blue or black. Since lawyers and other professionals often require blue ink, and I kind of like the retro look myself, the refills come with blue. You can replace with standard black refill anytime and from any office supply store....Parker style for Jazz and Cross style for the others. Try the blue for a while, you may fall in love with the look. 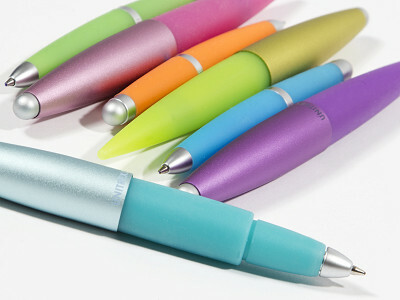 The pen may be mightier than the sword, but what about the stylus? The more typing and swiping we do, the more indispensable a digital stylus becomes. So which is mightier? With a Unitrex TouchPen, you don't have to choose between a touchscreen stylus and a conventional pen. You get both in one slick package. 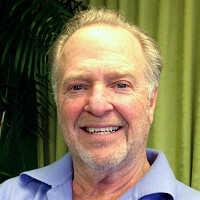 The creator, Les Wagenheim, developed the multitasking TouchPen for his wife, who had trouble using touchscreen devices with long fingernails. One end functions as a touchpad stylus with conductive properties so you can type, swipe and scroll with precision… and without smudging your smartphone or tablet screen with fingerprints. When you want to use a regular pen, simply remove the pen cover (6-inch JAZZ model) or twist the barrel (4-inch PALM version) to reveal a pen point.